The Australian-Belgian singer-songwriter, whose single featuring Kimbra has brought him runaway success around the world, became the first artist of the year to cross the 500,000 unit sales mark in Britain, ending the week with over 558,000 copies sold since release. The track has spent 10 weeks in the charts, including four non-consecutive weeks in the top spot. It saw off competition this week from Emeli Sande's Next To Me, which climbed one place to number two in the singles chart, and Nicki Minaj's Starships, which climbed two places to number three. London girl band Stooshe were this week's highest new entry, reaching number five with their debut single Love Me. Meanwhile in the album charts, veteran rocker Bruce Springsteen emerged victorious with his new release Wrecking Ball, the Official Charts Company said. 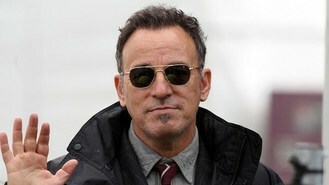 The Boss scored his ninth official number one album in the UK, winning the top spot by a margin of 18,000 copies, while Military Wives entered the chart at number two with their album In My Dreams. Springsteen, who has enjoyed a career spanning four decades, features contributions from Rage Against The Machine's Tom Morello and American musician Clarence Clemons on his latest release. Elsewhere, Lionel Richie's new album Tuskegee entered at number seven while Katie Melua's latest, Secret Symphony, came in one place lower at number eight. Named after Richie's hometown in Alabama, Tuskegee features a collection of the singer's classics reworked as country duets and features appearances by the likes of Kenny Rogers, Willie Nelson, Shania Twain and Pixie Lott.